The National Hispanic Institute officially honored its 2018 class of award winners tonight at Celebracion 2018 in San Marcos, Texas. 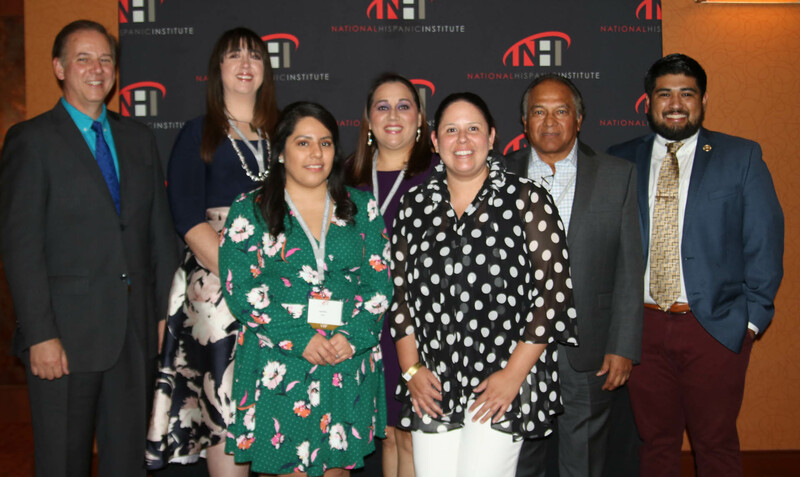 The honors included the presentation of a Hall of Fame Award — NHI’s highest honor, reserved for individuals who make a lasting contribution to the organization, typically measured in decades rather than years. Alvaro Maldonado, the longtime Colorado State University instrumental in starting the Colorado LDZ program commemorating its 30th year next summer, accepted the Hall of Fame Award, with founder Ernesto Nieto praising him for the quiet, humble, diligent work he’s done on NHI’s behalf — which legendarily includes his driving a fan full of Colorado high school students to the foundational 1989 New Mexico LDZ program, in the era, when NHI was first building its leadership education programs beyond Texas. Fernandez currently serves as Chief of Staff for Texas State Representative Diego Bernal, and is Co-Founder and Co-Owner of OCI Group, a San Antonio-based social purpose consulting firm focused on business and leadership development. Escobar, currently working on the Polis for Colorado Gubernatorial Campaign, also worked on Hillary Clinton’s 2016 Presidential Campaign and in U.S. Congressman Lloyd Doggett’s San Antonio office. Piñales is a San Marcos-based entrepreneur and founder and owner of Splash Coworking, an innovative ecosystem in the heart of Texas providing funding, mentoring and educational resources as well as a space for Central Texas professionals to work and create. Central Catholic High School, founded in San Antonio in 1852, is a college preparatory school educating young men from diverse backgrounds in the Marianist tradition for success, through the development of scholarship, leadership and moral character. Throughout its history, Central Catholic has earned renown as an academic and spiritual leader in values-based education. Santillan Perez has been counselor at what is now Roy Miller High School at Metropolitan School of Design (formerly just Roy Miller High School) since 2014, specifically as a college and career counselor since 2016, and she has been a Corpus Christi ISD employee since 2006. She was instrumental in relaunching NHI at her campus in 2015. Lopez began her NHI career as a student at the Midwest Young Leaders Conference in 2009, progressing to the 2010 National LDZ and the 2011 Northeast CWS. She then staffed the 2012 National LDZ, and since 2014, has staffed programs five straight summers — including four more National LDZs, three Midwest Great Debates, and a Texas CWS in 2017, the summer in which she staffed three programs. Inspired in part by the college-educated Latinas who recruited her into NHI, she is in the final year of a program in early childhood education and ESL education through National Louis University in Chicago. Along the way to her degree, she also studied at Morton College and Northeastern Illinois University. Martinez began his NHI involvement at the 2010 Texas Great Debate as part of the San Antonio team, and he continued his high school journey at the 2011 New York LDZ and the 2012 Texas CWS. While still in high school, he began his service as a staffer, working at the 2012 New York LDZ, continuing his NHI service as the onsite director of that event three years running, as well as interning at NHI headquarters and apprenticing as Educational Director at the Texas Ambassador Great Debate. This past May, Martinez completed his undergraduate degree at the University of Texas at Austin, majoring in biology and minoring in geography and the environment. Celebración 2018 is sponsored in part by State Farm.